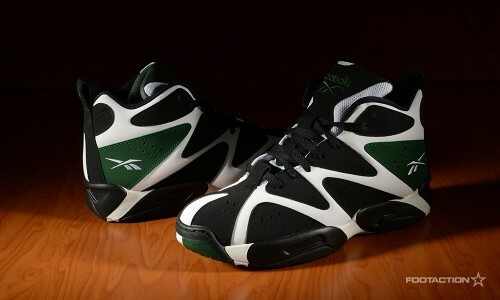 The Reebok Kamikaze I has seen several iterations and retro versions as of late, we’re pleased to show off one more. The sneaker is famously known as the signature shoe of Seattle Supersonics legend Shawn Kemp. The sneaker is made with a durable leather and synthetic upper for a supportive fit, padded insole to increase comfort, and a dependable rubber outsole once created to make traction on hardwood but has since been updated for streetwear. The Kamikaze’s upper features a distinctive black and white lightning/zig-zag design with a pop of rivet grey at the heel counter. Releases in stores and online on Friday. Print article This entry was posted by hhcblog on January 14, 2014 at 11:43 am, and is filed under Footwear. Follow any responses to this post through RSS 2.0. You can leave a response or trackback from your own site.